Two goals in 38 seconds from Canadian forward Tim Crowder and an outstanding netminding display from Miika Wiikman set the Genting Casino Coventry Blaze on course to a 5-2 win over the Dundee Stars at the Skydome Arena. 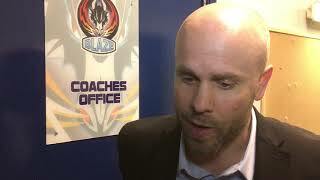 With British forward Ross Venus back in the line-up after an extended spell on the side-lines, and American forward Shawn Pauly also returning after missing last weekend’s games against Glasgow Clan, the Blaze were at full strength for the first time in weeks. Coventry netminder Wiikman made a couple of excellent saves early in the first period before Dundee took the lead when Francois Bouchard scored an unassisted goal on a broken play at 13.50. Quickly recognising his sides slow start an early time-out was unconventionally called by Blaze head coach Danny Stewart. With the Blaze struggling to find momentum, American defenceman Chris Joyaux did his best to fire up his team when he dropped the gloves with Fabrizio Ricci at 26.17, with both men receiving five-minute penalties for fighting. The Blaze finally got back on level terms when Crowder netted his first goal of the night on the powerplay at 34.55, and 38 seconds later he put the Blaze 2-1 up with his tenth league goal of the season. However, the Stars fought back and levelled things up through former Blaze forward Matt Marquardt at 48.44. Less than four minutes later, the Blaze were back in front when captain Kevin Morris got a touch on a shot from Alex Nikiforuk at 52.34. 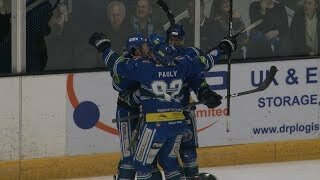 With Dundee’s Brian Hart given a two-minute penalty for holding with just over two minutes remaining, the Stars pulled netminder Pontus Sjogren as they searched for an equaliser and the Blaze took advantage, with Canadian defenceman Justin Hache scoring an empty net powerplay goal at 59.15. With the goalie pulled for a second time, Ben Lake finished the scoring with another empty net goal with 12 seconds remaining for a final score of 5-2. Wiikman was named Blaze man of the match after stopping 22 of 24 shots, while former Blaze defenceman Shawn Boutin was named Dundee’s best player.